The festival offers attendees both sit-down meals and food stands. You'll also find local Wisconsin beer at our Craft Beer Tent. Stoughton's own Viking Brew Pub will be back with their exclusive festival offering Soot in My Eye. You’ll find traditional Norwegian fare like Krumakake, and some not-so-traditional fare, like the Uff Da Hot Dog. You’re never far from foods of all kinds because food stands and sit-down dinners happen all over town. Stoughton non-profit groups run all the food stands as fundraisers. Please support them and enjoy feasting at the festival! Enjoy fine craft beers, entertainment, and fine food. The festival is excited to again partner with Wisconsin Brewing Company to bring you the finest Wisconsin beers. Also available on tap will be local flavors from Viking Brew Pub and Mershon’s Cider. Download their app for easy song requests! Thank you for supporting the food stands of Stoughton's non-profit groups. 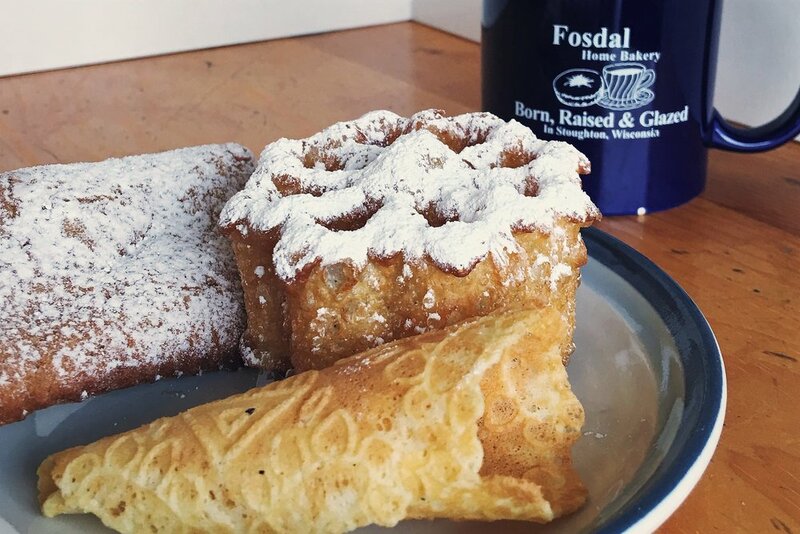 You'll find everything from cream puffs, corn on the cob, chicken wraps, and Uff Da dogs, and so much more! Take a look below at our participating non-profit groups and their menus. Famous Stoddard brats, veggie brats, hot dogs, strawberry shortcake, soda and water. Korean short rib taco, Puerto Rican pulled pork taco, ginger garlic chicken taco, blackbean and sweet potato taco, standard beef-lettuce-tomato-cheese taco, Mexican-style corn in a cup, and chips with salsa. All tacos can be converted into a “walking taco.” Pepsi, lemonade or limeade, and water. Coffee, hot chocolate, soda and water. Pies: plain or à la mode, cupcakes, hot and cold beverages. Norwegian meatballs, lefse, varme pølse (Norwegian-style hot dogs), warm and gooey deep-fried chocolate chip cookie bites, brats, cotton candy, sno cones, soda and water. Lefse and donuts, rømmegrøt, Norwegian and American bakery, coffee and cold beverages. See Sit-Down Meals for more food options. Lefse and donuts, rømmegrøt, Norwegian and American bakery, coffee and cold beverages. Carry outs available after the Sunday parade. Pizza Pit Pizza, soda, water, tea, strawberry lemonade, and pickle-on-a stick. Kona-Ice: Italian shaved ice with 50 different flavors to choose from or create your own. Famous deep-fried cheese curds, fresh creams puffs and soda. Cheese curds, grilled chicken breast sandwiches, grilled pork loin sandwiches, brats, hamburgers, hot dogs, chips, soda and water. Roasted corn, Viking dogs, chicken salad wraps, grilled chicken sandwiches, quarter-pound beef franks, bratwurst, steak sandwiches, frozen desserts, water and soda. Hot dogs, nachos, walking tacos, jumbo cotton candy, soda and water. Funnel cakes, mini-doughnuts, white and chocolate milk, coffee, cappuccino, tea and iced coffee. Choice of: the Uff-Da Special (Norwegian meatballs, lefse, Norwegian treat and herring) or Varme Pølse (Norwegian hot dogs). Served with Norwegian waffles with strawberries and whipped cream, soda, coffee and water. Also available: Norwegian napkin treats and American and Norwegian home-baked goods. Enjoy the annual à la carte luncheon buffet with Norwegian and American items and baked goods such as: meatballs, barbeque, lefse, rømmegrøt, sot suppe and riskrem. Bake sale held at the lodge and outdoor food stands. Carryout is available after the parade outside of the Lodge. Eggs, sausage, ham, pancakes, French toast, biscuits, sausage, homemade gravy, and beverages. Also, breads, soups, coffee, and more! 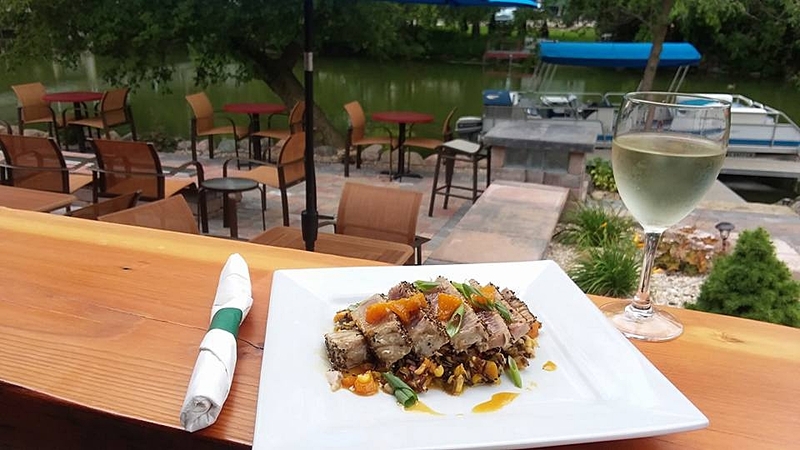 Situated along the Yahara River Nauti Norske offers Scandinavian inspired fare and burgers, salads, sandwiches, and more.